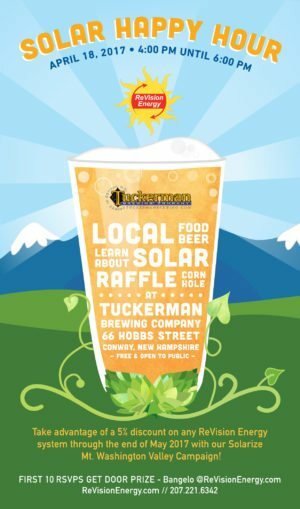 All are invited to Tuckerman Brewing Company for a Happy Hour with ReVision Energy! Tuesday April 18th from 4-6pm come join Revision Energy as we celebrate Mt. Washington Valley going Solar! With in-house licensed professional technicians and experienced engineers, ReVision Energy wants to help you learn how to capture your own clean, renewable solar electricity. Also offering a 5% discount through the end of May, 2017 with our Solarize Mt. Washington Valley Campaign, come learn why now is the perfect time! The first 10 RSVP’s get a door prize!